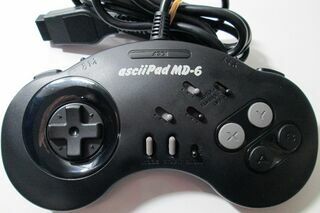 The asciiPad MD-6, known as the asciiPad SG-6 in North America is a third-party controller for the Sega Mega Drive manufactured by ASCII. It is an update to the asciiPad MD. The asciiPad MD-6 is very similar to a standard Mega Drive six button controller, however makes the Z and C face buttons shoulder buttons. It also has turbo features.